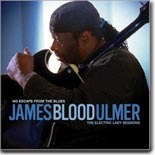 James Blood Ulmer's latest blues release, No Escape From The Blues, has more than a hint of Jimi Hendrix influence. It's this month's Pick Hit. Van Morrison's music has always been very roots-oriented, but he veers much closer to the blues on his latest, What's Wrong With This Picture? It's this month's Surprise pick. We flash back just a few years for this month's Flashback feature, taking a look back at the first of three exciting releases, Blues Money, from Canadian artist Michael Pickett. This month's What's New section includes new CDs from Duke Robillard, Shrimp City Slim, Ana Popovic, Walter Trout, Deacon John, Robert Randolph, Walt Love, and more, plus an in-depth look at one of the samplers accompanying the recent Public Broadcasting series on The Blues.